We here at The Serpents of Bienville have had a great year, and we couldn't have done it without your support! We have created five art prints based on local myths and ghost stories. We still have those available at the Store here on the site, along with shirts, stickers, buttons, and other stuff we made with you guys in mind. We have also done tons of blogs ranging in topics from murderous grandmothers to Jason Voorhees from Friday The 13th rooming in our local woods. You can check them all out on the Blog section of the site. Amanda has been bringing you guys some awesome stories every day on instagram about ghost stories, superstitions, facts, and eerie history of the area. This is, by far, the favorite of what we have going on, and you can check them all out in the Blog section of the site under "Alabama Oddities Weekly Rundown". It's been an amazing six months, and we have been fortunate enough to have the opportunity to bring you guys some of our most cherished stories. We have also started doing interviews with local artists, authors, and musicians. I have loved how these have been turning out, you can find them in our Blog section as well. We have a lot more new interviews coming up for the new year, including Q and A's with members of one of the most original and talented bands, The Pine Hill Haints, as well as interviews from the author of "Wicked Mobile" and an extremely hard working local filmmaker. Stay tuned for that! We have a lot of exciting things getting set up for the new year. First, we have been traveling around the state of Alabama, visiting old ghost towns and cemeteries, collecting information and taking pictures for a new blog series for you guys to enjoy. 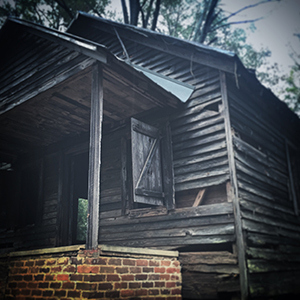 From Blakely, to Old Cahawba, to Old St. Stephens, we have been gathering the stories of the history of these ghost towns, what is there now, and what could have caused the populations to leave. Could it have been something more than just a moving population and, instead, something much more sinister? Learn more by following this three part series. We are also working on a series that ties together real life stories of Exorcism, visits from Death, and the Supernatural Sleeping Prophet of Alabama. Could some of these be explained by The Placebo Effect, and could a Placebo be far more dangerous than we think? Learn more by following this three part series. We are also working on a podcast for you guys to enjoy. We have been collecting true and unusual stories to bring to you guys in audio form. Nothing is better than gathering around a fire, telling eerie ghosts stories in the night, looking over your shoulder cautiously, just incase someone... might be... right behind you! We will be bringing you those, and much more in audio format. Stay tuned for details! Lastly, we are working on new art to make available for you guys. These prints are still available at our Store on the site. They are each based on a local myth or story that helps define our Southern Gulf Coast area. Each print we have is created by myself, all with micron pens, stippled shaded, dot by dot. When you look close up, you can see just how small the detail is. These usually take me around 30 hours to complete, and I am in the process of working on three more for you guys to be released later this year. You can view all the completed ones in the Collection section of the site. Thank you guys so much for the support, we couldn't do any of this without you! The Serpents of Bienville is a community, so we want stories from you guys! Do you have ghost stories from growing up, or tall tales your grandparents told you? We want to hear them! Send them to theserpentsofbienville@gmail.com, and we just might pick them to research and post on our site and social media. Again, thank you guys so much, we couldn't do any of this without you! We are The Serpents of Bienville.